I was very pleased that this Thursday’s Special from Paula is another Traces of the Past challenge. 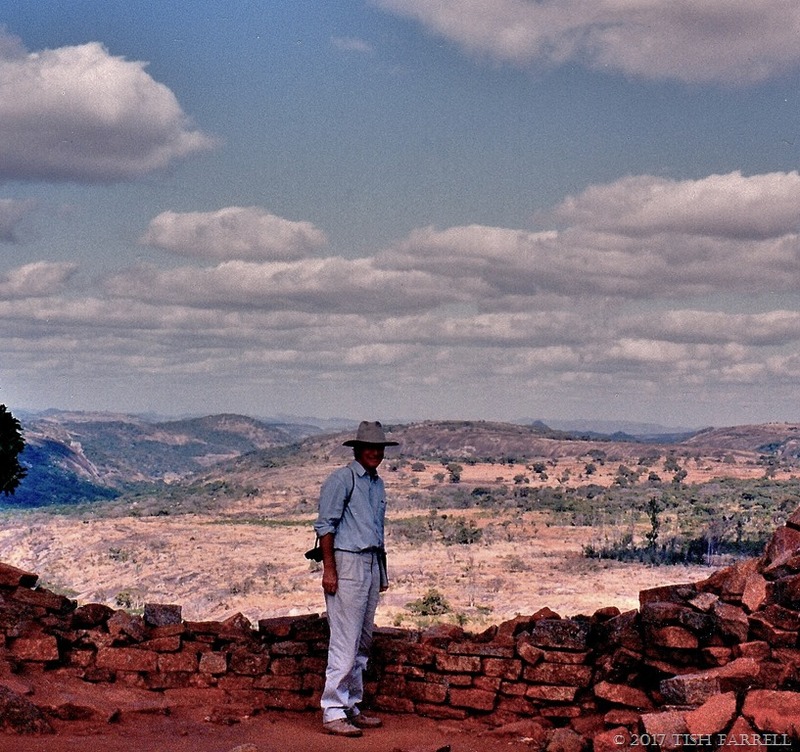 I spent yesterday afternoon attempting to scan these photos of Great Zimbabwe. I’ve shown other versions of these images before – scanned from negatives, but either I or the scanner was on the blink, and I wasn’t very happy with the results. Then the scanner broke altogether (it was a whizzo Nikon one too), and that was that. So yesterday I had a go with some of the original prints on the flat-bed scanner, which then led to a lot of dust-speck removing – very tedious. This is the best I’ve been able to do. The first shot shows the Great Enclosure, and the top of the mysterious stone tower within. The sci-fi plants on the left are giant aloes. This next shot is taken from the Hill site, where archaeologists have discovered gold and other metal working enclaves. 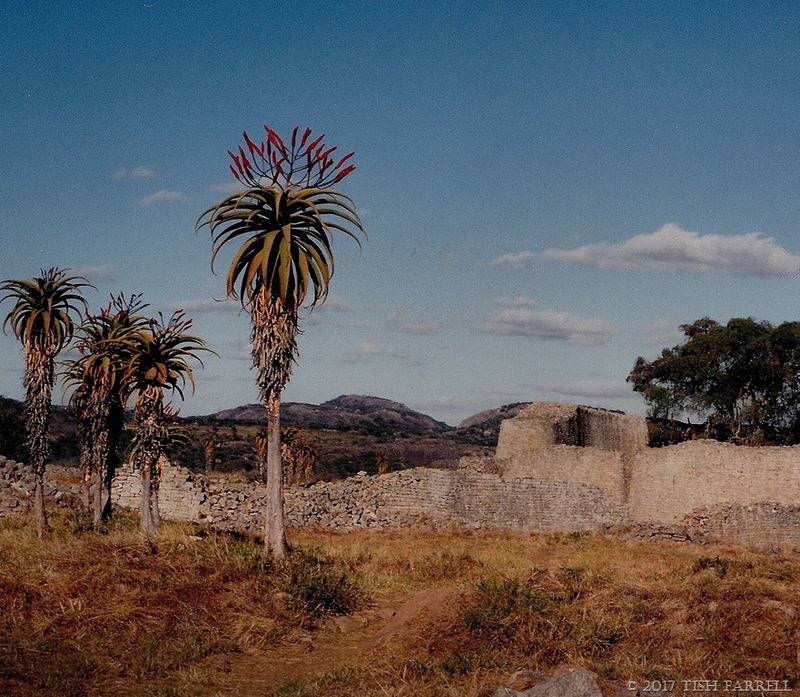 It gives a good sense of the surrounding terrain, although in the heyday of Great Zimbabwe, the environs may well have been a good deal more lush. The citizens’ domestic economy revolved around cattle herding, and indeed, one of the theories for the city’s demise in the C15th is over-grazing. But I’m sure there was more to it than that. Great Zimbabwe was part of an extensive trade network throughout the period equivalent to Europe’s early Middle Ages. Its merchants trekked in caravans to the Mozambique coast, taking gold and ivory to trade with Arab dhow merchants of the Swahili seaboard cities. It is very possible, then, that the gold floating around Europe and the Middle East in Crusader times came from Great Zimbabwe. In other words, it was not the remote settlement it may seem today; it was strongly connected to the Old World’s wheeler-dealer networks. Nor was it the only great African city state in southern Africa. So much of the continent’s human history remains to be discovered and told; historian Basil Davidson made a good start, though most of his works may be out of print now. And it was Peter Garlake who wrote the classic work on Great Zimbabwe (1973). I only wish I’d taken more photos while I was there. We were being distracted by a travelling companion who was intent on not noticing that we were visiting one of the world’s most fascinating archaeological sites. Ah well. Anyway, looking at these photos now, it all looks very dreamlike, and that’s how it felt at the time. But I’ll leave you with a few hard facts. 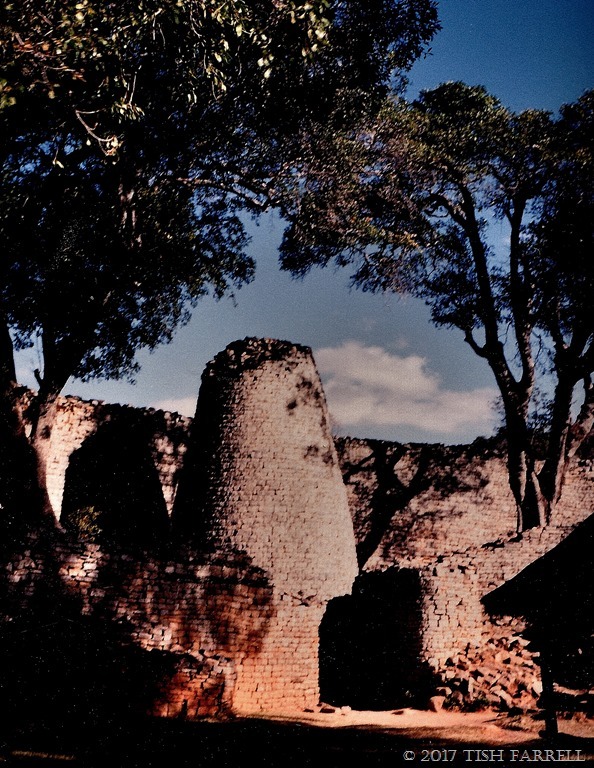 Great Zimbabwe was built and lived in by Shona people between 1000 and 1500. The enclosure walls, though often monumental, were seemingly never defensive. The entrances are simply open, undefended spaces. The stone came from the nearby granite hills, and was cut and laid without mortar. The walls vary from 4 to 17 feet in width with some reaching over 30 feet in height. It is, in short, a very amazing place, and I have written other posts with more of the history. But oh, wouldn’t it be wonderful if these walls could speak and tell us their stories! 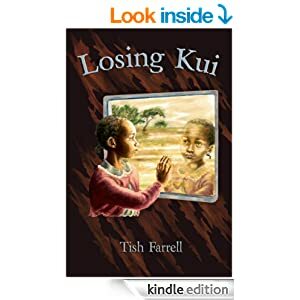 Posted on March 9, 2017 by Tish Farrell	This entry was posted in African History, Travel and tagged Great Zimbabwe, Thursday's Special, Tish Farrell Writer. Bookmark the permalink. I always love diving back into Africa’s history with you, Tish, and this was no exception. They have scanned very well Tish. Those walls may not quite be speaking, but I think they are issuing emotions. The place feels alive. Those are definitely better scans! Wonderful pictures then and now! It was the most amazing weather – winter in southern Africa so slanted afternoon light, all very still and golden. Lovely! And I bet I know who was the anonymous companion!! It was naughty of me to mention it, but yep. You got it. I love the way that first shot looks, Tish. 🙂 Long ago and far away in many senses. It’s such a pity that there is so little information about the history of the African nations, as you say there must be so many stories. I have a whopping coffee table book by Basil Davidson ‘Africa- history of a continent’ first published in the 1960s. And another vintage one of his: ‘African Kingdoms’. They are a cultural feast, and a real eye-opener on Africa’s early empires. But as you say, Gilly, there is a lack of history. Also a horrid assumption that African peoples had no history before the Europeans invaded. Then there’s the obscuring of facts – i.e. that the ancient civilization of Egypt was actually an African civilization with its roots deep in African prehistory. I have always been fascinated by images of this place. Your photos have a dreamy quality that conveys a sense of the mystery. A happy weekend to you, too, Janet. It’s not looking too bright on the sun front, though was glorious yesterday. I have never thought to revisit my travels through my pictures. It’s weird, really. I take massive amounts of photographs, stick them in albums and then they generally languish gathering dust somewhere, lost on my shelves. I’m glad you are not nearly that neglectful! Wonderful. I am now contemplating looking through my old photos to see if there is anything worth scanning. Thank you so much for the trouble, Tish and sorry that I couldn’t come here before my trip. They are beautifully composed with palm trees that seem alive. Thank you, dear Tish. It was better than I had hoped.